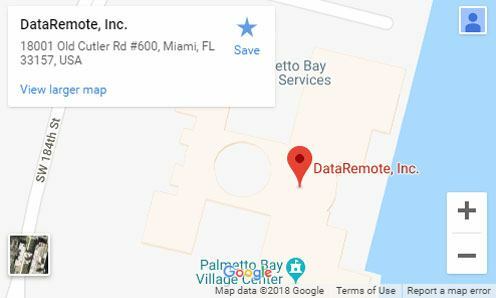 Miami, FL – July 12, 2018 – In response to changing market conditions and to position itself for future growth, DataRemote, Inc. – a Miami-based wireless technology company – recently moved into new facilities in the Palmetto Bay Business Center in Miami. The new facilities will enable DataRemote to hire additional staff and strengthen the company’s role as a leader in the Internet of Things (IoT). The IoT is the network of physical devices, vehicles, buildings and other items—embedded with electronics, software, sensors, actuators, and network connectivity that enable these objects to collect and exchange data. “The investment in the new facility improves our efficiency, allows for future expansion, and enables us to showcase our latest technology in the local community,” says President, Robert Moses. Chief Operational Officer (COO) Kevin Fouche said a strong customer base along the East Coast, as well as in South Florida is important to the location. “We ship all over the world, but many strategic partners are based in South Florida. These relationships are very important to DataRemote, and encourage us to remain based in the Southeast,” he said. DataRemote is a solutions company with expertise in the changing IoT marketplace. IoT allows objects to be sensed and controlled remotely across existing network infrastructure. DataRemote, Inc. designs, manufactures, and markets machine-to-machine (M2M) products, cellular modems, and routers to businesses and channel partners. It offers M2M wireless communication solutions for remote meter reading; gas, water, and oil flow monitoring; power station control; variable message signs; and cellular ATM transactions. The company has strategic relationships with AT&T and CalAmp. DataRemote, Inc. was founded in 1991 and is headquartered in Miami, Florida.